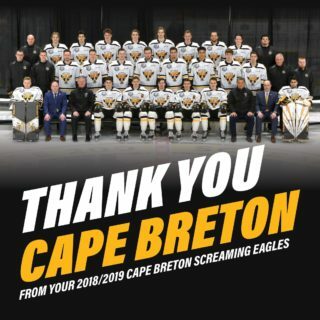 SYDNEY- The Drummondville Voltigeurs took a stranglehold on their first round series with the Cape Breton Screaming Eagles on Wednesday night. 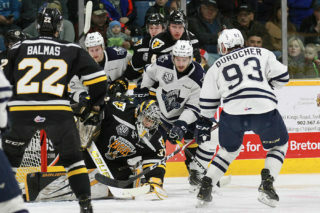 Following a 4-1 victory the Voltigeurs now lead the series 3-1. It was a fairly pedestrian first period with each team just registering six shots on goal, and neither team converting on their lone power play opportunity. However the Voltigeurs would score at even strength. 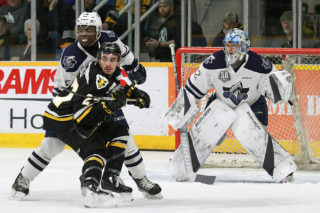 Cédric Desruisseaux swung around the net and was able to jam it into the short side past Mandolese and the visitors carried a 1-0 lead into the second period. Cape Breton would outshoot Drummondville in the second period, but couldn’t solve Olivier Rodrigue. Just past the three minute mark the Drummondville lead would double as Jarrett Baker ripped a shot through traffic past Mandolese. 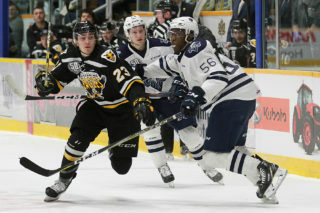 The second period would feature some 4 on 4 play- first coming when Cape Breton’s Ross MacDougall took a minor 14 seconds after Drummondville’s Xavier Bernard was already in the box, and later in the period when Xavier Simoneau of the Voltigeurs and Declan Smith of the Screaming Eagles served coincidental minors. No one could take advantage of the open ice and Drummondville led 2-0 heading into the third period. Special teams would factor into the third period, as Nicolas Beaudin added to the visitors’ lead on the man advantage at the 7:07 mark. Shortly after the Volts had the chance to put in the dagger as Phélix Martineau was whistle off for boarding, but the Eagles were able to kill the penalty off. There would be a breakthrough for the home team at the 11:29 mark. Following a big hit by Ty Fournier, the puck came loose to Declan Smith who blasted it by Rodrigue to get the home team on the board and give them to chance to come back in the game. With almost full four minutes remaining, Screaming Eagles coach Marc-André Dumont would lift Mandolese in favour of an extra attacker. The Eagles would generate some pressure but couldn’t find another goal, and at 17:44 Pavel Koltygin would skate through the netural zone, into the Eagles end and hit the empty net to seal the win. Rodrigue picked up the win, stopping 23 of 24 shots. Mandolese took the loss, allowing three goals on 24 shots.